Skilled lawyers helping families throughout Washington, D.C.
Cerebral palsy is the name given to movement disorders caused by damage to a fetus’s brain. There is no one form of cerebral palsy, and its symptoms may vary from person to person. At Paulson & Nace, PLLC, we are well aware of how severe the symptoms of cerebral palsy can become, and that it sometimes takes years before they manifest. We have helped families throughout Washington, D.C. obtain the compensation they need in order to provide support and care for their children afflicted by cerebral palsy. If your child developed CP as a result of medical negligence, we may be able to help you, too. The Mayo Clinic also states that rigidity may be apparent in the trunk of the child’s body, and that “abnormal posture” could indicate cerebral palsy. Some children may also suffer with an imbalance in their eye muscles or have difficulties swallowing. 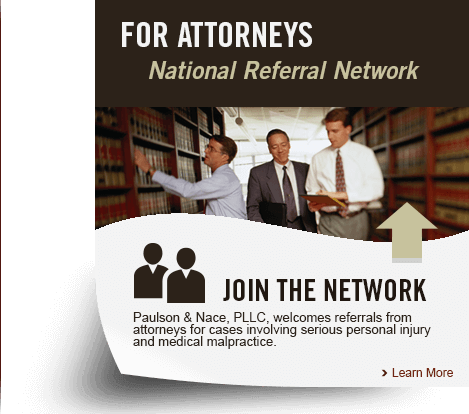 At Paulson & Nace, we handle complex medical malpractice cases like these with diligence. We pay meticulous attention to details, and use only authoritative testimony when appropriate for a case. Over the past 40 years, our team has secured millions of dollars for our clients, including one jury verdict for $2.75 million for a child with cerebral palsy. We are aggressive patient advocates who are not afraid to hold healthcare providers accountable for their mistakes in the courtroom; in fact, we thrive in such atmospheres. That is why so many of our clients and our peers throughout Washington, D.C., and West Virginia call us for complex birth injury cases. CP can be a debilitating disease, requiring a lifetime of care. At Paulson & Nace, PLLC, we help families in Washington, D.C. obtain the resources and compensation they need in order to give their children the best opportunities in life. If your child developed cerebral palsy after an error was made during the birthing process, please call 202-930-0292 or fill out our contact form.